I don’t think it would be an exaggeration to say that I would be dead today if not for the CoughAssist Mechanical Insufflator-Exsufflator. The what? OK, let’s just call it the CoughAssist. What is it? Well, it does exactly what it says. It is a mechanical device attached to a mouthpiece or mask which assists people by simulating a natural cough. This is accomplished by gradually forcing air deep into the lungs, then quickly reversing and drawing air back out again. The concept is simple enough, but the end result is literally life-changing for people with disabilities that weaken their respiratory muscles. Without this device, every single chest cold could potentially lead to hospitalization. I am simply unable to clear my own airways without it. My machine acts as a surrogate for my chest and diaphragm muscles, expelling mucus that could otherwise become a breeding ground for viruses and bacteria. Unfortunately, many people are still unaware of its existence. I live in a large county, one of the largest in Florida. The hospital I usually go to is probably the largest in the county. 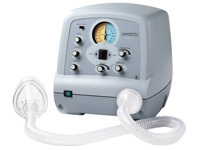 Despite this, I often run into respiratory therapists, and even pulmonologists, who either have never heard of the device or never worked with one. One doctor I had actually told me that I was experiencing lung failure, and that a tracheostomy was the only solution. Keep in mind, this was almost 10 years ago, and I have yet to require such an invasive intervention. All I needed was to clear the congestion from my lungs. Thankfully, I found a new doctor. After a couple weeks of frequent nebulizer and CoughAssist treatments, and regular doses of guaifenesin, I was back to normal (normal for me, at least). What would have happened if I had simply followed the first doctor’s advice? According to him, my only recourse was a tracheostomy and 24 hour ventilation support. Not only did he advise me wrongly, he then went on to describe the horrible quality of life I could expect while on a ventilator. I was told that I most likely would be robbed of my ability to speak, my ability to interact with the world. This didn’t make sense to me, because I knew of others at MDA camp and in online forums who were able to speak while on a ventilator. Yet there was a small part of me that wondered if they were just exceptions. The doctor went on to tell me that this was merely the end-stage of the progression of my disease. He told my crying girlfriend and I that we should create a living will and decide whether or not I wanted life support when the time came. I wonder how many people would believe his dark portrayal of life on a ventilator and choose to let their life end when respiratory support became essential? Of course I now know that he was either woefully ill-informed or a total jackass. As I said, I haven’t needed a tracheostomy for the last 10 years or so. It wasn’t even until recently that I began using noninvasive volume ventilation (another option that wasn’t presented to me) during part of the day. Not only that, but the information he gave me about quality of life and ventilation with the tracheostomy was also factually incorrect. Most of the people on ventilators I have encountered, in person and online, speak quite clearly. Some of them tell me their voice is stronger and clearer than it had been before the operation. With the new generation of compact and portable ventilators, it is also feasible for them to live relatively active lifestyles. They are not all shut-ins or imprisoned in a nursing facility as many of us have been led to believe. This is why you cannot depend on medical professionals to know exactly what you need in every situation. Many hospitals will not even have a machine like the CoughAssist available to you when you get sick. When I go to the hospital, I bring my own. You must be your own advocate and do your own research. There’s nothing wrong with collecting information on your own, presenting it to your doctor, and requesting a prescription. Don’t let the ignorance of others decide your fate.